Foreigner with Finnish wife, building a house in Finland. Initially we didn’t know a thing about building and there is not much information available in English how to manage it in Finland. This project is our long-term dream coming true yet it is very complex. Especially if you really want to understand how your money is spent. This blog is a sort of diary where we will share our experiences with everyone. And yes, it will all be written in non-native English ;) mixed with some Finnish too. The land where the house will be built is made of clay (savimaa - old bottom of the sea) and therefore the foundation has to be made on pillars (7-10m long) that are standing on the firmer ground beyond the clay. Then on top of the pillars will be put hollow core floor beams of 26.5cm thick. Then insulating material 25 cm (Expanded polystyrene (EPS)) and a concrete floor of 8-10 cm thick into which also the floor heating pipes will be installed. Below is a picture I've taken of the way it sort of looks although our insulation is bigger than in the picture where I guess is only 20cm and the side plinth beam will be from solid concrete. The foundation is not coming from Lapponia house so we had to get the whole package from another company. We had asked quite a few companies for quotations but not many offer ther complete package ( pillars, beams, insulation, concrete floor casting, etc). We got basically offers from 2 companies for the complete package: Basso (via Lapponia sales agent) and Me-Perustukset. The initial Basso offer was 50 % (!) more expensive than the one from Me-perustukset. Only after Basso found out the fact that we got a much cheaper offer from ME, Basso also came down to a much similar price. But then we did not want to consider their offer anymore as we felt Basso initially tried to ripp us off. 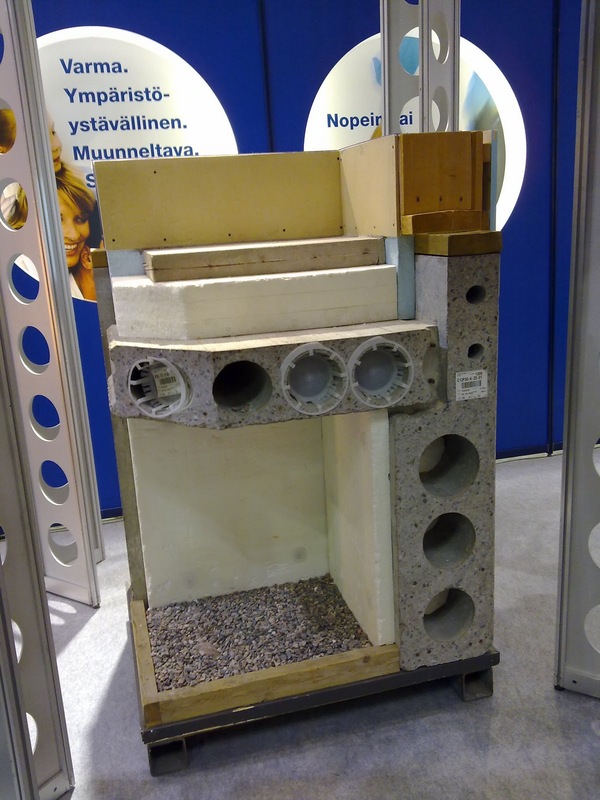 Also Basso's offer did not include making the ventilation holes and also it requires to pay separately if the foundation/ concrete needs heating during the colder season. So far I have been happy with the service from Me-perustukset and the sales person speaks very well english (Mikko Kuoppa - Update Nov 2011 - Mikko left the company we were told). Even more of a pleasant surprise was that the during the design fase, the Me-perustukset planner came with a proposal for a different set up of the foundation which needed less plinth beams and steel pillars than were quoted in the initial offer and therefore we got a reduction of 2000 euro in the total price! We concluded not to recommend anymore ME-perustukset due to the fact that they have been delaying our garage foundation for very long during the summer and the contact person from ME was saying many times that they come next week, and then next week etc. And when they came they have made the garage pillars too weak. Our head-designer / vastaava meestari asked them to correct it and after couple more weeks they came and made the pillars again but then once again they were wrong (not fulfilling the standards). ME-perustukset contact person mentioned that the garage foundation was being made by a subcontractor of theirs but that does excuse them, I would say. The third time went right, after our head-designer explained them on the spot what went wrong. Foundation contractors trying to rip you off sounds familiar. For Villa Linnea, we got essentially two identical offers: one for 12300 and the other one for 16500 Euro. Same scope, same materials, same everything. Go figure. Hi, is Villa linea your own model? We were also for a while thinking about a house model from Mammutti but in the end we choose for Lapponia as they were more flexible about changes to the bottom of the houses. another one .....well i do not know how they tie the beams to the piles but on some cases if the groung its known for high humidity you can use bituminous felt or sheets of rubber inbetween the piles and the beams as its known that concrete conducts moisture and in time or in a very rainy year the water will slowly climb up through the piles the into the beams....the rubber sheets(pads) can also take any vibrations...and make a better transfer during the settling period....every new house settles in its first period especialy after you load it with all your furniture and whatnot. Thank you for the comments Florin. Indeed the ground is quite humid. The plinth beams (side beams) at standing on the metal pillars and are insulated from the ground on the inside with EPS and on the outside with some antifrost board. I guess the metal pillars do not conduct humidity or? Underneath the plinth beams there is also some sort of hardened insulation. On the outside and the inside there is stone gravel and there are rain water collectors around the house in the ground to keep the base dry. The floor beams are not insulated on the ouside (underneath) and they are standing on the plinth beams. The moisture/moulding under the house is a concern indeed. There will be air vents in the plinth beams and also there is an air pipe that comes from the crawling space of the foundation to the roof of the house and this should keep the foundation ventilated based on the difference in the air pressure, hopefully. The ventilation is also needed to make sure there is no trapped radon gas in the foundation which could pass to the house. 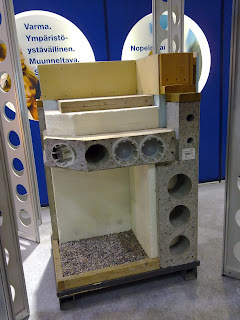 Radon is a gas that could exist in grounds in Finland where there is granite. This gas is sort of radioactive and can cause cancer if inhalled for longer term in not-well ventilated spaces. haha, yes, methodical I have to be, or I try to be because it's not all so easy to understand this stuff in Finnish or English. And unfortunately the construction foreman and the land contractor don't speak English. This project costs anyway a fortune so I hope it's done right :). Anyway, I will ask the foundation designer about the outside insulation if it only insulates the plinth beams just from frost or also for wetness. Thanks bro! Greetings from the still snowy Finland! The Green Directory has the most comprehensive selection of Green, Eco, Sustainable, Fair Trade and Environmentally Friendly Companies, Products and Services. Use the eco directory to find green, eco, fair trade, recycled and sustainable businesses, services, news, events, articles and guides. The land work has started TODAY! Permit to demolish the cottage is HERE! Villa Ainala » Mitä tekisin toisin? These are our opinions and nothing else. Picture Window theme. Theme images by dfli. Powered by Blogger.